Drivers who use Suitland Parkway or Interstate 295 to navigate through the District should get ready for a new traffic pattern set to take effect later this week. The changes signal the next phase of construction associated with the District's biggest road project to date. Editor’s Note: The implementation of the new traffic pattern was postponed until the night of March 11, 2019. Drivers who use Suitland Parkway or Interstate 295 to navigate through the District should get ready for a new traffic pattern set to take effect later this week. The changes signal the next phase of construction associated with the District’s biggest road project to date. 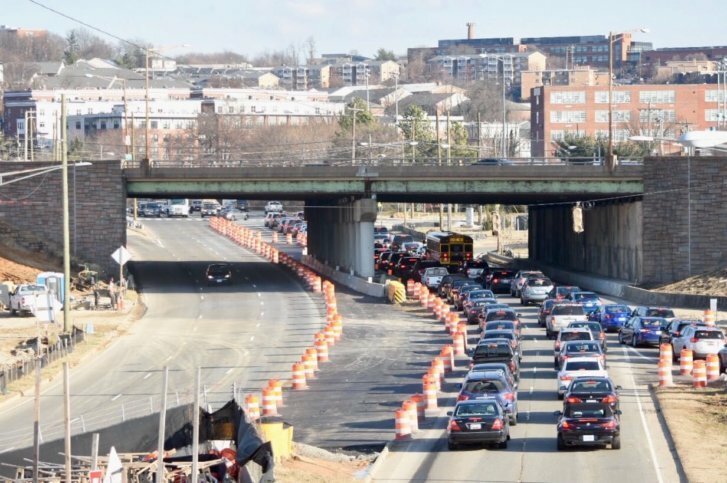 The District Department of Transportation said that beginning on or around Thursday, outbound drivers on the Suitland Parkway will be shifted under I-295. Between South Capitol Street and Firth Sterling Avenue, two lanes of traffic will get by construction both ways at all times. Inbound drivers will be driving on a familiar side of the parkway but outbound drivers will be shifted to the left underneath I-295, DDOT said. The ramp from the outbound lanes onto northbound I-295 will be closed. Temporary traffic lights will be activated at the bottom of a newly widened exit ramp from southbound I-295 onto the outbound lanes of the parkway. Even with the extra capacity, traffic could backup on the ramp and cause delays for drivers on the Southeast-Southwest Freeway headed for I-295 during heavy travel periods. A temporary traffic signal will also be activated at the bottom of the ramp that leads drivers from the northbound lanes of I-295 into the inbound Suitland Parkway toward South Capitol Street. DDOT plans to keep the old outbound lanes of Suitland Parkway closed until September as work on the mammoth Frederick Douglass Bridge Project — which includes a revamped I-295 interchange — continues. The $441 million undertaking is just one of several active infrastructure projects taking place along the Route 295 corridor, from Pennsylvania Avenue to Blue Plains.